The need for clean drinking water goes without saying, but in case you still need to hear it…’Water is Life’ as the old saying goes. For whatever the occasion; hiking, backpacking, first aid preparation, mission trips or in the event of natural disasters, having a clean source of water is a must, in order to sustain life. Now, that’s on a deep much broader spectrum. Hands down, no one can debate the fact that we must ensure our water is clean before consumption. I mean, you wouldn’t feed your car engine sludge, so why would you feed your body muck? In this Sawyer water filter review, we’re going to examine why we need clean water in first place, then go right into the options available to get our water clean before it is consumed. Water in its most natural state is pure and clean. But when you throw in a couple of mild to moderate or deadly organisms like viruses, bad bacteria, etc. and to that you add some chemical contaminants such as lead, arsenic and mercury, you’ll get a ‘bouillon’ of nasty stuff that can take life threatening to a whole new level. And what’s worse, they’re all invisible to the naked eye! Woo, good thing someone had the sense to think up ways to clean our water, or none of us would be here today. So let’s take a look at the top four ways in which people have come up with to ‘clean’ our water. Boiling: Undoubtedly one of the more simple methods thought up to get our water clean enough to drink without causing harm. As with cooking food, the heat of the fire kills bacteria and any other harmful organisms in meat at a temperature of more than 80 degrees. It’s the same for water. When the boiling temperature climbs to more than 80 degrees, you can bet your bottom dollar, that any living invisible creature swimming around in there, is gonna go bye bye. Remember, we’re looking at lightweight, simple to use stuff, so your tools should match the method. Though this may be a great method of ‘cleaning’ your drinking water, if you’re on the go, then be sure to pack your trusty pots and pans and look forward to building a fire to even get started. Chemical Treatments: But what about the chemical pollutants? Unfortunately, boiling by itself cannot rid the water of these bad boys, so to beat the enemy at his own game; we have to call in the chemical troops. Using chlorine, bleach or iodine is a very effective way of handling chemical pollutants. But there’s a catch, you have to know the right dosage to use when choosing this method of water purification. This is a method which does require some preemptive knowledge of how chemical components work, and the dosages as it relates to how much chemical to kill off a certain percentage of pollutants, to the measurement of the water to be ‘cleaned’. Distillation: This involves boiling of the water and then condensing the steam into a clean container. This is a method used for ‘cleaning’ seawater. It is especially important in regions where water resources or tap water is not suitable for ingesting without boiling or chemical treatment. Distilled water is also used for drinking water in arid seaside areas lacking sufficient fresh water, via desalination of seawater. Yet another method which requires additional tools and know-how. If you’re someone on the go, this may not be the best method of ‘cleaning’ your water. Membrane Filtration: This is widely used for filtering both drinking water and sewage. For drinking water, membrane filters can remove virtually all particles larger than 0.2 μm—including giardia and From all the water purifying devices, water filters are by far, the most versatile and reusable devices on the market. And then we have the ultimate invention. Whoever thought of this definitely had ‘everyone’ in mind. With the rise in instances of water pollution, natural disasters and the ever growing health conscious man and woman, this method of ‘cleaning’ water is by far the most sensible choice for anyone on the go. In the early 80’s, the world experienced a remarkable breakthrough in technology and science, with the aspect of surviving Mother Nature’s elements made simple, when Sawyer Products came to be. Water filtration, insect repellents, sunscreens and first aid became synonymous with the Sawyer products name. Over 30 years of rigorous testing and innovation have made it possible for this company to offer more effective and reliable products to those who not only want them, but need them. No, it’s not just for campers or hikers or outdoorsmen/women. It’s for the health conscious, moms and dads on the go, athletes, children, natural disaster victims, patients, etc. It’s available as a Personal System with one and three included water pouches, or as an All-in-One System. For now, let’s take a look at water filtration and the PointOne Squeeze Water Filter System with the three different sized pouches. Also referred to as the SP131. Sawyer Products PointOne Squeeze Water Filter System weighs in at about 3 oz. with a filter material of hollow fiber. The actual filter is compatible with most water bottles, inline, straw and pouch. This personal water filtration system is one of the most reliable systems available on the market provided by Sawyer. Anyone in the outdoors, whether hiking or backpacking or anyone on the go. It fits comfortably in a backpack, pocket book, handbag or other carrying bag or case. Emergency Preparedness Kits for hurricanes, earthquakes, flooding, boil alerts, etc. In moments of unexpected or even expected disasters, the water supply can and most times, become very unsafe to drink due to particles and debris which may contaminate the water. Having one or a few of these water filtration systems would cut the possibility of ingesting ‘unclean’ water by more than half. This water filtration system can be a part of a first aid kit in homes and in other dwellings where first aid would be useful or needed. Homes, Hospitals, Schools, etc. Whenever there is a question mark over the quality of a water source in a public area, having your own person Sawyer water filtration system can be lifesaving. Especially in places where persons are already sick or recovering, or places with children, where building back the body’s defenses or maintaining them, is a key factor in sustaining life, this system can be quite useful. 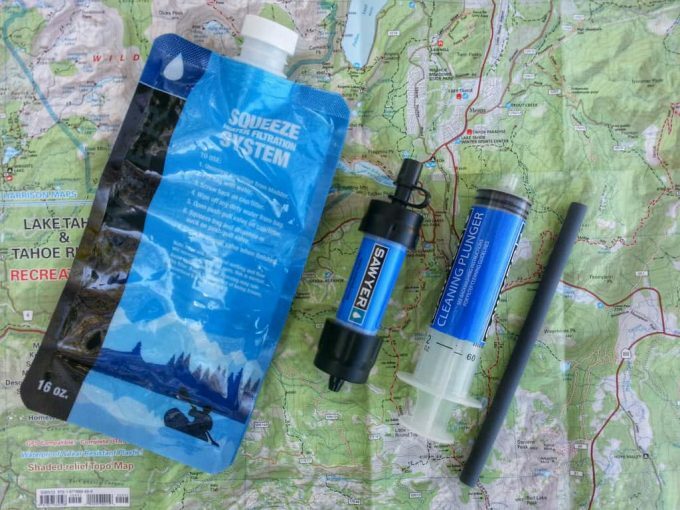 Sawyer prides itself on manufacturing and providing a water filtration system in the PointOne Squeeze, that it’s almost easy to understand why it won the 2012 Editor’s Choice Award, in BACKPACKER Magazine! According to its website, the kit includes collapsible pouches that are made from durable Mylar foil (100% BPA FREE). These pouches come in three sizes; 16oz, 32oz and the 64oz. They can be rolled tightly for easy packing away, and can be used hundreds of times, if used correctly that is. Also quite innovative and functional, is that the Sawyer Products PointOne Squeeze Water Filter System has a removable push/pull cap built right in, so you can screw the filter onto your water bottle, and squirt water straight into your mouth. If you don’t want to use it that way, you can use it to fill your water bottle or someone else’s. It takes less than 31 seconds to fill most water bottles. Although Sawyer is confident that you won’t really have an urgent need to consistently clean your filter, they would not neglect that part of the system. So maintain the Sawyer PointOne Squeeze Water Filter’s performance level, they’ve included a syringe to backflush the filter. The PointOne will also fit the threads on most bottles of water that you buy at a grocery store and what’s super cool? It’s great for international travel too. Did I also mention that this kit is incredibly easy to use? The Squeeze System comes with simple cleaning and maintenance instructions that even a child can follow. Now with any product, with such a great responsibility on its ‘shoulders’, you’d want to ask the next question that most people tend to ask when they find out about a product that’s too good to be true. So, does the Sawyer PointOne Squeeze have any bad baggage? Let’s take a quick look at the pros and cons. The water filters from the pouch, into a secondary source in about 30 seconds. When not in use, you can roll up your pouch for easy storage. The filter itself lasts a lifetime and compared to other filters, beat them 20:1. The pouches are made of a durable material which means they are also reusable. Kit comes with pouches of different sizes for additional water. Backed by manufacturer’s lifetime warranty (Independent Testing Laboratory Hydrein LLC. ; Microbiological Report S05-03). Winner of BACKPACKER Magazine’s highly sought after Editor’s Choice Award in 2012. Filter Life has a lifetime warranty. Some users have reported leaks while others claim this never happened to them, so possibly mileage may play a factor here. The pouch cannot just be submerged to fill it, as some persons may be thinking. Instead, it is advisable to use a canteen or cup or flask to collect water from the source, and then pour into the pouch. Manufacturer defects may occur. When opening the package, one customer advised other potential users not to use the squeeze bags that the kit comes with. Not totally convinced about whether or not this water filtration system takes the cake and you need to see to believe? Hey, I get it, I’d feel the same way too if I were you. So let’s take a look at a few videos, to see if we can put these questions to rest. I think we will all agree when I say, that drinking clean water is a staple in our lives. With all the methods out there on how to keep it clean, in whatever the circumstances, having a Sawyer Products PointOne Squeeze Water Filter System that is not only lightweight, but also easy to use, will make life a lot easier. I mean, being concerned about the purity of your water supply is one thing, but having to worry about how to get it ‘clean’ should never be headache, and thankfully, is now a thing of the past. It doesn’t take a genius to figure out that the Sawyer PointOne Squeeze Water Filter System is a force to be reckoned with. But don’t take my word for it. Try it out for yourself and see why thousands of people have rated this product 4 and 5 stars on various retail sites such as Amazon.com. Like what you’ve read and seen? Would you like to own a Sawyer PointOne Squeeze Water Filter System? Have you used this filter system yourself? What did you think? Or maybe you have a different system you think is better?